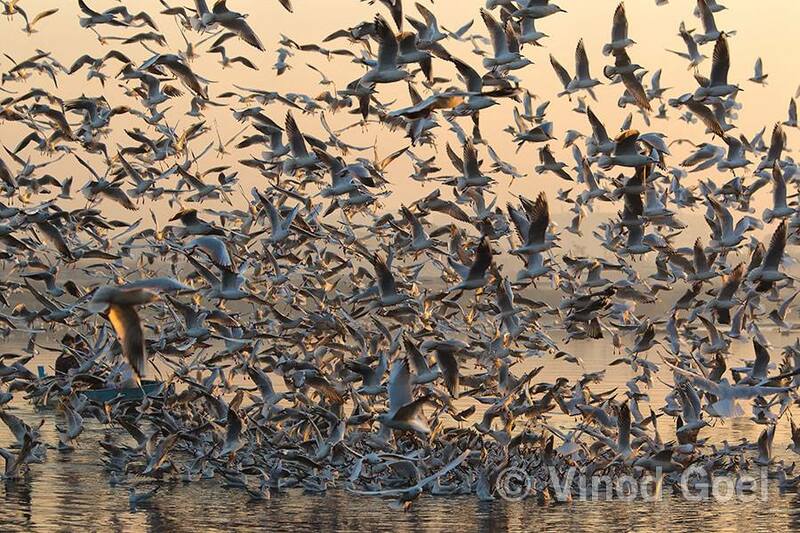 One of my friend Arun Gupta, an avid birder and who owns a well known hospitality property Shaheen Bagh at Dehradun told that a large number of gulls come to the Yamuna Ghat near I S B T in the heart of Delhi. Initially I did not believe it but I thought of verifying it. Accordingly I went to the designated place on 1st December 2012 in the early morning . At the first sight I could observe a few birds. Slowly and slowly saw a number of them coming from metro bridge side and made themselves comfortable on the water. I also observed a flock of birds coming from Okhla side. The ghat is between two well known marks. On the left is metro rail bridge and on right flank is old iron rail bridge which is more than 100 years old. One of the boat man at the Yamuna Ghat informed that these birds start visiting this ghat from Oct and remains up to end of Feb .
We could see a large flock of birds coming from the east as well from the west. These are black or brown headed gulls. When they arrive in Delhi the head is not black but by the time they are ready for their backward journey to the breeding habitat the head bears the black or brown color. The question is why these birds come to such a place which has the dirtiest water in DELHI as all the drains outlet is in the Yamuna river. In fact we should not call this Yamuna river as it has lost its identity and this has become a big NALA. We observed that some persons come daily with namkeen seb or bhujia. They hire a boat and sail to the middle of the river and off load the entire content in the water. Immediately the gulls in hundreds pick up the morsels from the water. One can appreciate it when one observes it. It was amazing to see such a large number of black or brown headed gulls in the midst of the city. Later on I invited one of the tour operators of DELHI who is running a tours and travel company for the last 20 years. He was surprised to see the gulls that too in such large number. It is in thousands. Believe me. The Black headed gulls migrate from Europe and Central Asia and the brown headed gulls migrate from high plateaus of Central Asia and Tajikstan. It is difficult to differentiate between the black and brown headed gulls when they arrive in October as both of them support the white head. However by the end of Feb they start acquiring their colours and one can recognise them easily. From Oct to Feb is the best time to observe their activities . Generally birds are very shy and avoid human presence. But these are quite bold and ready to share the table if food is laid on it. Come and try at the Yamuna Ghat besides the Nigambodh Ghat in the midst of chaotic city for all reasons. There are three places in N C R of Delhi where the gulls can be observed. These are (1) Yamuna Ghat (2) Yamuna Biodiversity Park Phase 2 in North Delhi(3) Okhla Bird sanctuary at Kalindi Kunj. 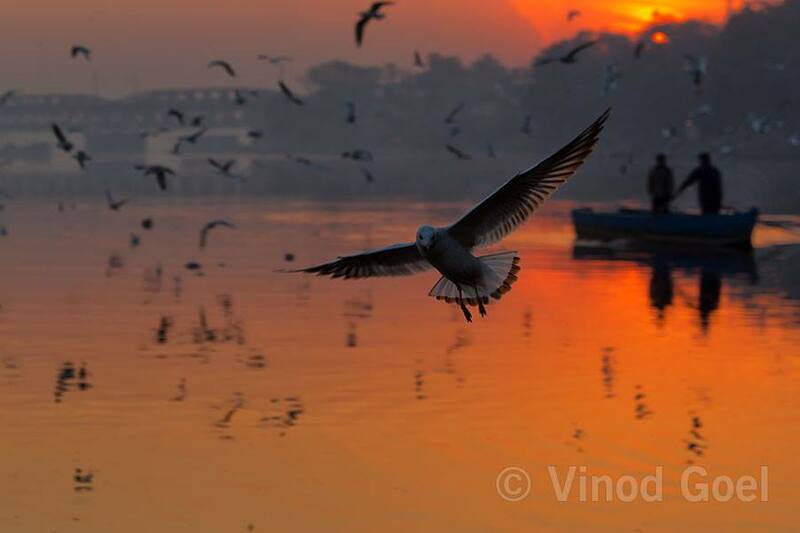 Gulls are prime scavengers and ready to eat anything although some people on daily basis visit the Yamuna Ghat and ride a boat and offer namkeen to the foreigner who visit the capital of India without any visa and passport and enjoy the best Delhi’s hospitality.